Utah’s offense hopes to complete a remarkable October run. 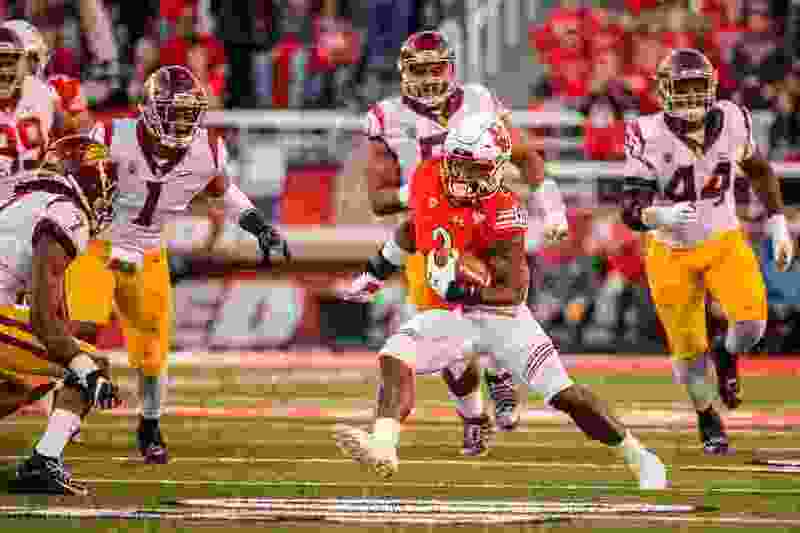 (Trent Nelson | The Salt Lake Tribune) Utah Utes running back Zack Moss (2) runs the ball as the Utah Utes host the USC Trojans, NCAA football at Rice-Eccles Stadium in Salt Lake City, Saturday Oct. 20, 2018. Utah's successful October is making memories of September blurry to the Utes' offensive players. August? That month, they remember. The Utes suddenly look like the team they thought would become, as of preseason football camp in August. That’s when they were passing, running and generally stressing one of the country’s best defenses in practice. Then came the struggles of September, a month that now seems so long ago that Britain Covey, the team’s star receiver and storyteller, was convinced the team’s bye week occurred after losses to both Washington and Washington State. The break came between those games. Even so, Covey stuck to his theory, believing the offense’s film study during that week off reminded the players they were close to breaking through. That has happened in October, and the Utes hope to complete a highly productive month Friday night against UCLA at the Rose Bowl in Pasadena, Calif.
Aided by one defensive touchdown, Utah has scored 40-plus points in three straight games for the first time since 2010, mixing the strong running of Zack Moss with the efficient passing of Tyler Huntley. The offense should thrive against the Bruins, who rank 101st in the country in rushing defense, allowing 192.7 yards, and 100th in total defense (425.4). Moss may even approach the school-record 332 rushing yards that former teammate Joe Williams amassed against UCLA in October 2016. Just for fun, the Utes will wear the same uniform combination as two years ago: black pants, white jerseys and black helmets. Both @Utah_Football and @UCLAFootball have lots of momentum right now coming off consecutive wins. Any suggestion of this Ute offense compiling huge numbers would have seemed silly in September. At that stage, some fans were demanding to know what media members had seen in practice snapshots that led to encouraging preseason reports. For the first time this deep into any season in the program's Pac-12 era, Utah (5-2) ranks in the top half of the conference in total offense. The Utes, averaging 425.9 yards, are tied for fifth with Colorado in the Pac-12 and they're in the top 50 nationally. Twice this month, Athlon Sports has named Utah's Troy Taylor the national offensive coordinator of the week. Taylor's offense generated 541 yards against USC, with 38 of the Utes' 41 points stemming from drives that started in their half of the field. Moss ran for 136 yards and Huntley passed for 341 yards, with six wide receivers and three tight ends making receptions. Four players caught touchdown passes. It's better now, and the Utes have big possibilities. Four more conference wins would guarantee them a berth in the Pac-12 championship game. That would extend their streak to seven games, which is asking a lot. That’s not a new theory. The creator of the “Win the Day” mantra is former Oregon coach Chip Kelly. He’s now coaching UCLA. At the Rose Bowl, Pasadena, Calif.
Kickoff • Friday, 8:30 p.m. MDT. Records • Utah 5-2 (3-2 Pac-12); UCLA 2-5 (2-2 Pac-12). Series history • UCLA leads, 11-5. Last meeting • Utah 48, UCLA 17 (2017). About the Utes • Utah is 4-3 vs. UCLA in the Pac-12 era, with wins in the last two visits to the Rose Bowl. … LB Chase Hansen is second in the FBS with 14 tackles for loss and is a two-time Pac-12 Defensive Player of the Week. … QB Tyler Huntley is third in the Pac-12 in completion percentage (.657). About the Bruins • Freshman QB Dorian Thompson-Robinson is “good to go,” said coach Chip Kelly, after missing most of last week’s game. … UCLA has allowed 26 or more points in every game, except for a 37-7 win over California. … Stefan Flintoff leads the Pac-12 in punting average (47.0 yards).